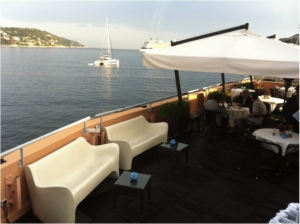 It’s pretty hard to beat the stunning views from our 2013 classroom in Villefranche-sur-Mer, but f you have ever been to the English Cotswold’s you will know that it can be possible. The Stanton Guildhouse is set in an elevated position in the hamlet of Stanton, close to Broadway, one of the most beautiful villages in Britain. From the grounds of The Guildhouse you can see for ten miles across open countryside, look down towards the hamlet’s honeyed thatched cottages and stroll next door to a truly English country pub. As settings go this one is hard to beat. This year we have assembled another truly amazing faculty, and with the range of facilities we have at The Guildhouse, there will be an even greater emphasis on doing, connecting and creating. ….and a little nostalgia for those who remember 2013…. If only all classrooms were like this! The view from The School of Curiosity. Join The School of Curiosity for an unforgettable three days involving artists; poets; philosophers; musicians; a few bizarre people who are busting the boundaries of their world; and quite probably a celebrity or two. The aim is to help a hundred or so delegates to significantly enhance their curiosity through events, activities and just by connecting with other people and other ideas – fortune favours the connected. Why? Because there’s a massive body of research that shows that curious people live longer; are happier; enjoy better relationships; find more opportunity; and find small pockets of meaning in their everyday lives. Who doesn’t want that? wondering what you up to…..
Glad you noticed Clementine. We are getting ready for The School of Curiosity End of Summer School 23-25 October 2013 here in Villefranche. Full details will be released shortly, please do tell everyone you know.Hope to see you there. I will be long gone in october.. I live in London… I am still wondering what is the school of curiosity about? It is hard no to spot Clementine! Malcolm – serendipitously I met someone over dinner last night who recommended the School of Curiosity. I would love to come this year. I had to smile at your profile as it resembled mine so much! Just heard about this event from my coach. It looks like it will be absolutely fantastic! what a brilliant idea. i will be looking to see if i can organise things so i can attend! Your coach must be a brilliant genius Gordon! Do everything in your power to get here. It’s going to be amazing.